The folks over at CineFix have taken superhero blockbuster Guardians of the Galaxy and turned into an awesome arcade classic. We've possibly stumbled across the greatest video game that was never created. 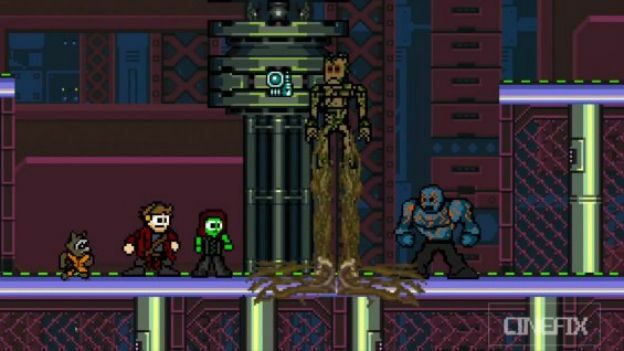 Marvel fanboys behold…Guardians of the Galaxy reimagined as a retro 8-bit arcade game! The concept was thought up by David and Henry Dutton from YouTube channel CineFix. If you're a fan of the space superhero flick, then we urge you to watch this amazing gaming tribute. The creators managed to flesh out some of the film's best scenes, repackaging them into the arcade gaming format. All the gang including Star-Lord, Gamora, Drax, Groot and Rocket are side-walking about to the catchy 70s soundtrack, which features on Peter Quill's mixtape throughout the film. While the arcade reimagining may not contain the same big-budget special effects, it certainly begs the question: why haven't the gaming powers that be released a Guardians of the Galaxy video game? With plenty of memorable action scenes and laugh-out-loud moments, the 8-bit remake definitely shows potential in the franchise transferring to gaming. Even the film's director agrees, with James Gunn writing in the YouTube comments: "I love it." If you want more 8-bit cinematic remakes, then head over to CineFix. Meanwhile enjoy the Guardians of the Galaxy edition below.